I talked to a local taxi driver today and he said that Mama's Restaurant is closed. 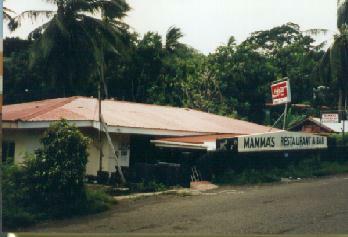 Mama's Restaurant was the most unique culinary experience in the world! Yes, the most unique culinary experience in the world. She provided a 26 course meal served for over 3 hours, reservations REQUIRED!!! Mama was a "big woman" about 300 to 400 lbs and she could cook anything. In fact she cooked anything! The restaurant would have never earned a fancy rating but it was unique in the world by my experience (and I've been to many of the fancy restaurants around the world where they charge $400 per person and more). Mama's restaurant was a tin shack with plywood tables and benches; red and white checkered plastic table cloths were stapled to the plywood. Bring your own mosquito spray for your legs. You had to show up by 6:30pm and serving began at 7:00pm sharp. Everyone is served the same course at the same time. A new course is severed every 5 to 7 minutes so you are there for 3 hours or more for the complete experience. Mama cooked everything… (honestly) if her family caught it or it was run over on the road in front of her house, she cooked it. Soup, fried bread, lobster, lambis, sea slugs, goat, chicken, possum, armadillo, beef, pork, pidgin, fish, etc. Each dish was severed and you were told what it contained and the decision to eat it or not was yours. I think I hold the record for my table each time I've been to Mama's. If I recall properly I've done at most 24 course of Mama's. I wish I could remember which dishes I wouldn't eat. But everything tasted great, sometimes the texture wasn't what you would like… but hey, how many of us have eaten sea slugs or armadillo? Mama could have tenderized and cook by old tennis shoes. Mama died many years ago and her sisters ran the place for a couple of years until they died. Now everything is closed. Just take a close look at the picture. Is this the kind of place you would expect to have a world class foodie experience with a reservation REQUIRED? What a loss for the island and for foodies around the world.